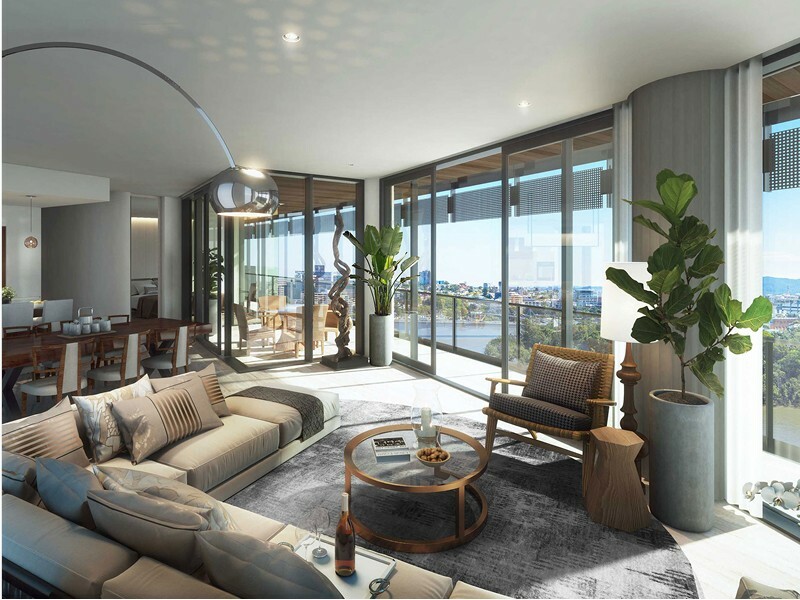 Banyan Tree Residences is a luxury off-the-plan apartment development situated on the banks of Brisbane River at Kangaroo Point. 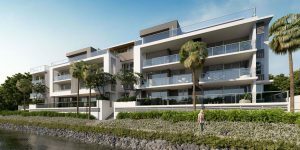 This residential development has been brought to Brisbane shores by the international resort company, Banyan Tree Hotels & Resorts. The project sits on an elevated 2,200m² site and offers one, two, three and four-bedroom configurations. 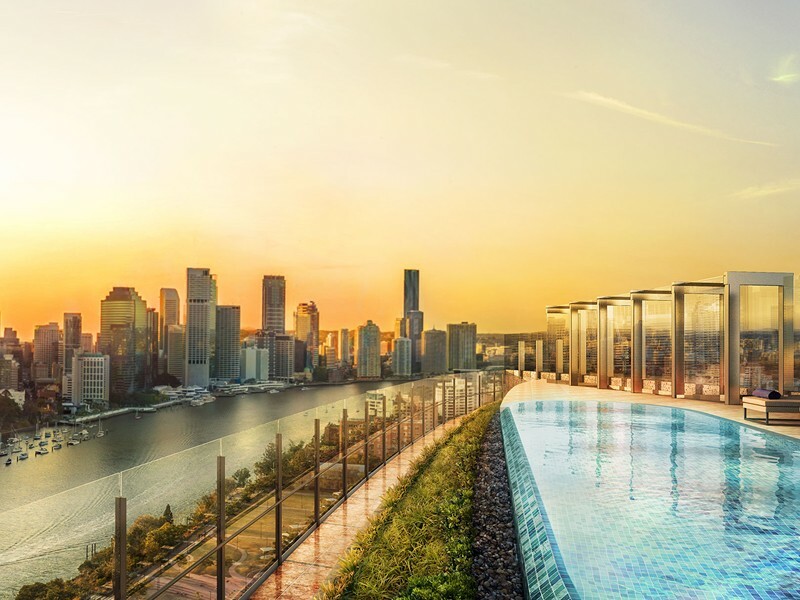 The 100 apartments of Banyan Tree Residences will be spread over 10 levels and the building will include a full-floor rooftop terrace complete with the resort-style facilities you would expect from Banyan Tree Hotels & Resorts. Buyers at Banyan Tree Residences get exclusive access to deals and discounts at the Banyan Tree hotels worldwide, as well as a week’s free holiday every year for the first five years (how’s that for an incentive!). Banyan Tree was the winner of the “Best Apartment/Condominium” in Queensland and the “Best Development Marketing” at the International Property Awards in 2018. 100 owner-occupier geared apartments over 10 levels. Prices range from $550,000 to $6.9 million. Construction is anticipated to begin in 2019 with completion expected sometime during 2021. Banyan Tree Residences is best described as boutique ‘ 6-star hotel’ style residences. It boasts opulent finishes throughout, curved walls and quality fittings. Banyan Tree Residences is perhaps one of a select few choices with this level of finishes currently available in Brisbane. 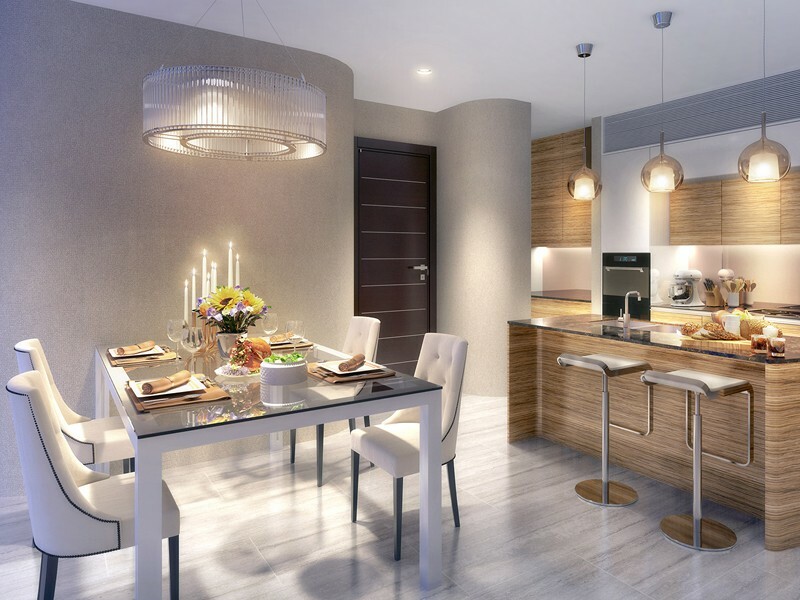 Each apartment in the building, from the entry-level one bedrooms to the most expensive penthouse, will be appointed with the same high-level fixtures and fittings. As of July 2018, 70% of the upper-level apartments are already sold. Purchasing an apartment at Banyan Tree Residences gives buyers exclusive access to the Sanctuary Club, offering discounts and special rewards at all resorts and hotels managed by Bayan Tree around the world. Off-the-plan buyers at Banyan Tree Residence also get a remarkable one week of accommodation COMPLETELY FREE at any Banyan Tree Resort once a year, every year for the first five years of their residency. All the Banyan Tree apartments are also quite large, clearly targeting the owner-occupier market. The smallest two-bedroom configuration is 109m² total, while the largest penthouse spans 631m². 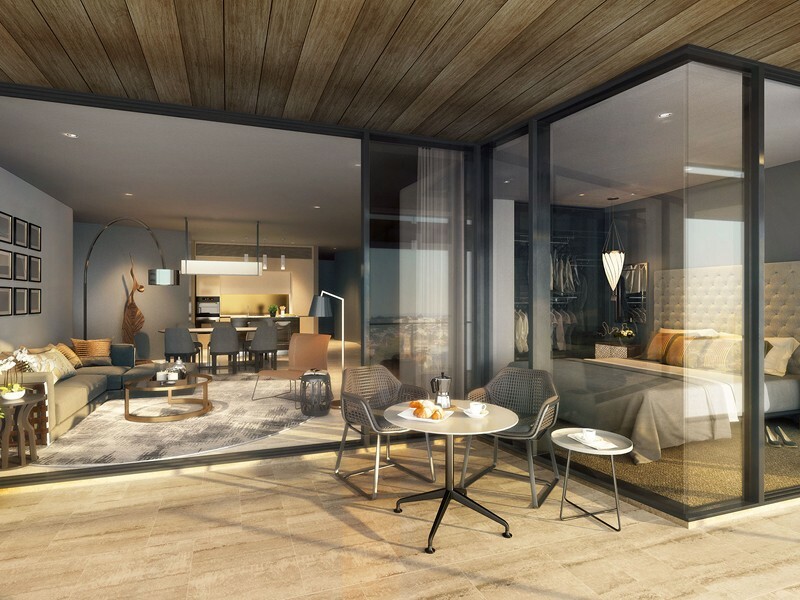 Banyan Tree Residences has also launched a number of one-bedroom apartments priced within the first-home buyer bracket. These are selling quickly, with 25% already sold. There are four penthouses available at Banyan Tree Residences, each with their own private pool and terrace garden. The views from the upper-level apartments are rare to find, with stunning vistas out over the Brisbane River and CBD. When it comes to buyer incentives, no-one does it quite like Banyan Tree (free holidays and facials anyone?). The layout of each apartment is very unique, offering curved walls and high ceilings. Banyan Tree Residences is located between two busy roads so some traffic noise might be heard. During peak hour, these roads can be very congested. The river-facing apartments start at $1.5 million. With the construction date not officially announced yet, the completion date may not be until late 2021. Banyan Tree Residences is situated on the corner of River Terrace and Main Street, Kangaroo Point. This cliffside location offers views of the CBD, Brisbane River and Botanic Gardens. 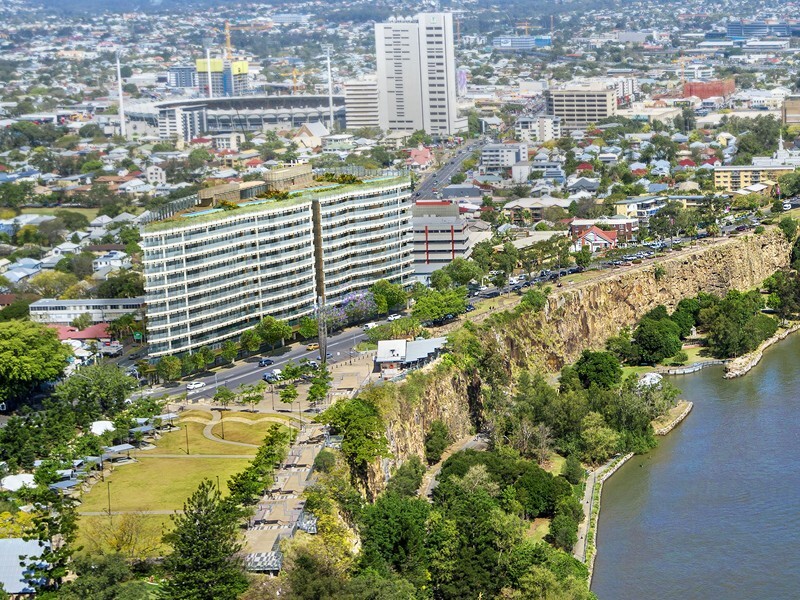 The Kangaroo Point Cliffs sit directly across the road from the development site. These cliffs are without a doubt one of the most adored of iconic locations in Brisbane, providing a unique inner-city recreational space. The immediate area offers parks, bike tracks, walkways and barbecue areas. It’s also the most popular spot for outdoor rock-climbing in Brisbane with novices and professionals flocking to tackle the cliff faces every weekend. Just 100m from Banyan Tree, at the top of the cliffs, sits the appropriately named The Cliffs cafe. A great spot for coffee, this cafe has just about the best view of any cafe in Brisbane. Just three minutes down Lytton Road is a small shopping complex that has an IGA, a pharmacy and a Spoon Cafe. Just 1km down the road you’ll also find The Gabba which hosts AFL games, cricket matches and stadium concerts. 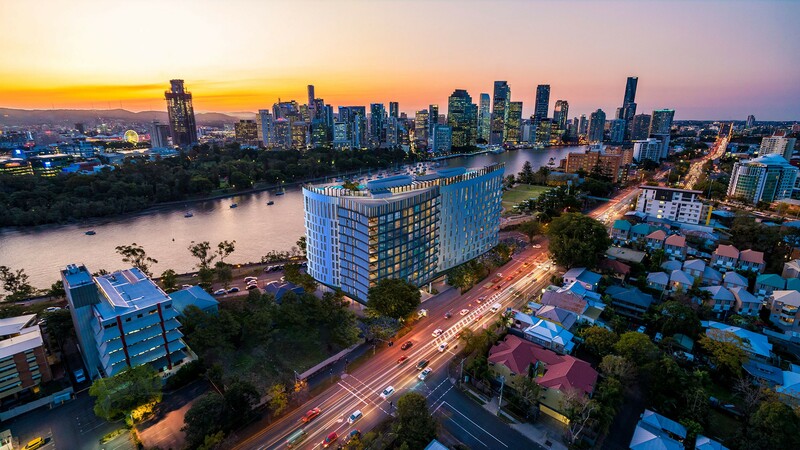 The whole Woolloongabba precinct is undergoing major development at the moment, with a multi-million dollar facelift planned for the next few years. 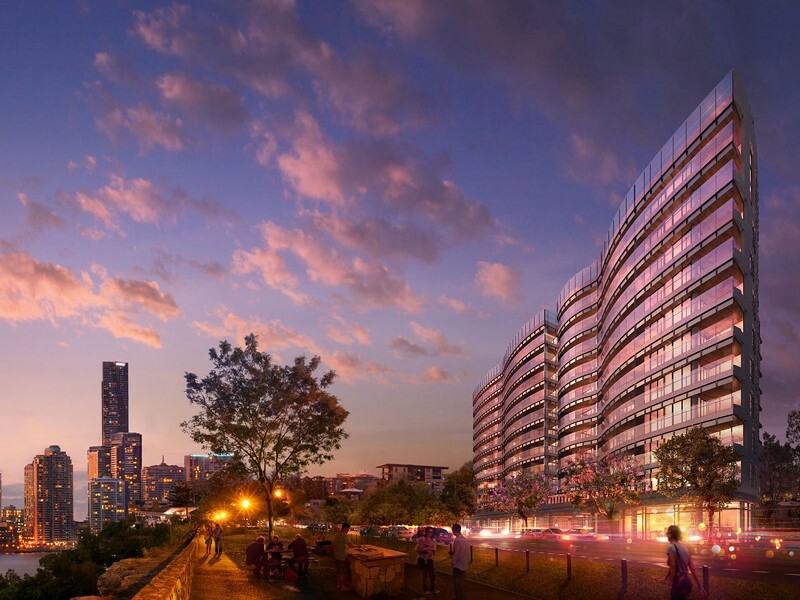 The development is located 1km from the CBD and 2.5km from the Grey Street dining and entertainment precinct at Southbank. Access to both of these areas is pretty easy from the Bayan Tree Residences. Both are accessible on foot or by bike on dedicated pathways that run into the city and to Southbank. In terms of road access, River Terrace and Main Street are both quite busy roads that service a large volume of through traffic, particularly at peak hour. Expect slow going for commuters around this area. Being centrally located, there is also convenient public transport access provided by the City Cat and buses. The Cross River Rail project, spearheaded by the State Government is set to transform transport to and around the Kangaroo Point area, although this isn’t expected to be operational until 2024 at the earliest. Banyan Tree Residences looking towards Woolloongabba. Image from Banyan Tree. 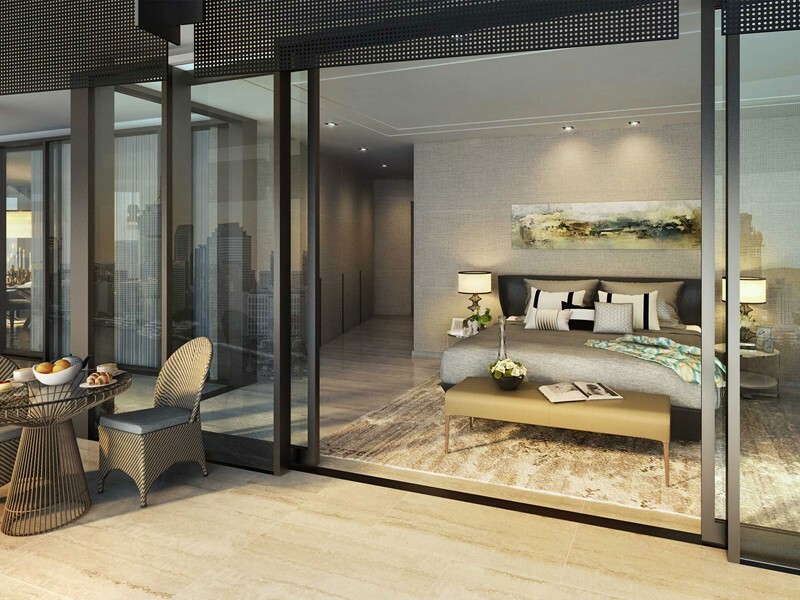 Residents at the Banyan Tree Brisbane will gain access to a number of amenities and benefits. There is a 24-hour concierge that offers a range of services, some of which are included in body corporate fees and others that are available for a fee. On the ground floor of the building, there is a secure lobby, as well as a function room and gym for residents. There will also be a restaurant and a Banyan Tree Spa that will be open to the public. In yet another special offer for residents, they will receive one free treatment at this spa each month for two years. Say hello to regular mud masks! The jewel in the crown is the rooftop deck will provide residents with a large infinity pool, garden and barbecue facilities. The common area of the rooftop is landscaped with tropical-inspired gardens providing excellent views over the city and a summer sunset to remember. As well as expansive BBQ facilities, the rooftop also features a stunning private dining room. Also on the rooftop, you’ll find three private pools which belong to the penthouses. Although these share a floor with the communal pool, private gardens and screens make them feel very private. Banyan Tree Residences pool. Image from Banyan Tree. 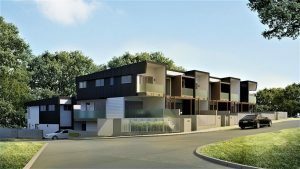 This development comprises of 40 one-bedroom apartments, 41 two-bedroom apartments, 15 three-bedroom apartments and four penthouses. 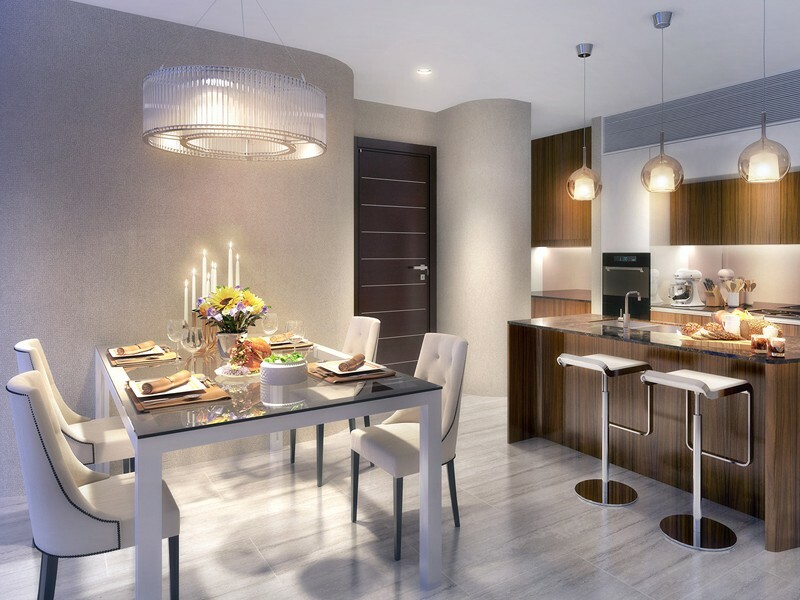 The interior of each apartment shows the attention to detail of the design team. Banyan Tree Residences offers a curved wall design, which is something that is not commonly seen in Brisbane. This feature is not entirely efficient space-wise (or cost-effective) but it is striking and creates an inviting, light-filled space that’s very reminiscent of luxury hotels. 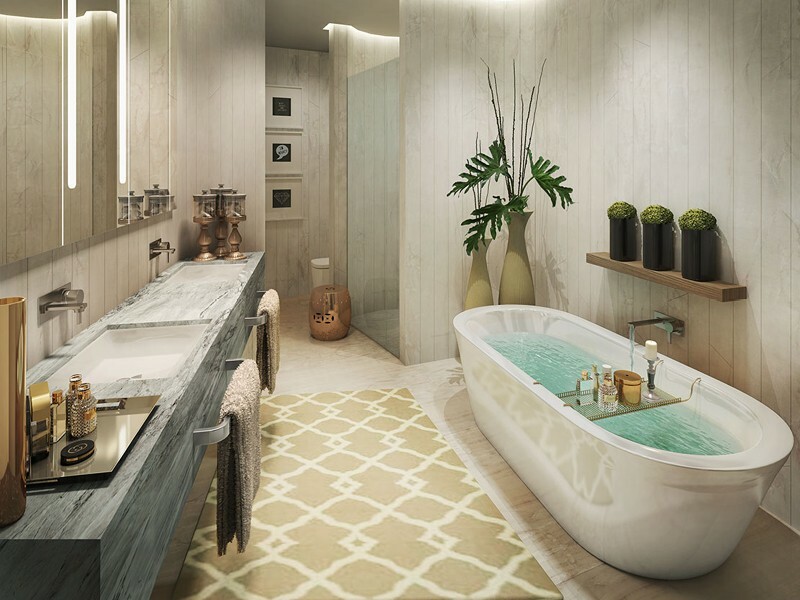 The 2.8m ceilings also add to the luxury open-plan feeling of the apartments at Banyan Tree Residences. In consideration of the traffic noise that may come from the surrounding roads, Banyan Tree Residences has ensured all doors and windows of apartments come standard with thickly-glazed glass. With the balcony doors shut, the road noise essentially disappears (the display unit on site is fitted with these doors and it is worth going to check out how effective they are at cutting out the road noise).There is plenty of parking with four basement levels of car park to ensure each two bedroom apartment and most three bedroom apartments have two side-by-side spaces. Some of the more expensive three bedroom apartments and the penthouses come with three side-by-side car parks as standard. There are also 19 spaces for visitors. Banyan Tree Residences Brisbane. Image provided by Banyan Tree. It seems no expense has been spared with the fixtures and fittings inside these off-the-plan apartments at Banyan Tree Residences. Each apartment has the same level of appointment, highlighting the importance that the developer places on quality. Every aspect of the residence has its own special touch, from the leather finish on the wardrobe doors, to the marble benchtops throughout (yes, even in the laundry). Each apartment has ducted climate control and the lights can be controlled by a central touchscreen panel. Top of the range appliances are standard in all apartments at Banyan Tree Residences. The laundry has a Miele washing machine and clothes dryer, while the kitchen boasts an induction cooktop, large oven and microwave from Miele as well. On top of this, there is a large, integrated double fridge and freezer and a wine fridge. There are two different colour schemes for buyers to choose from. The dark colour scheme features a lot of dark wood and slate colours whereas the light colour scheme features a lot of lighter, ashy tones. One of the benefits of buying your off-the-plan apartment before construction begins is choosing from the available colour schemes. 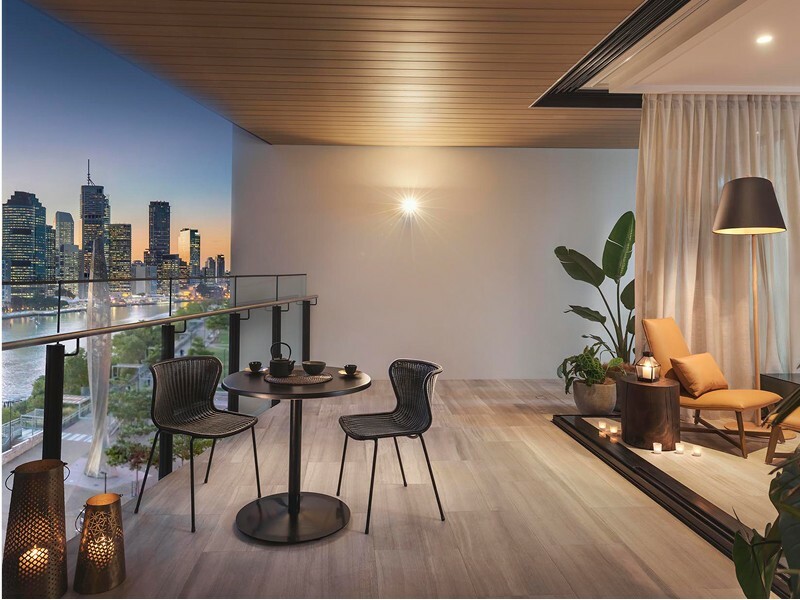 It’s no surprise that the apartments at Banyan Tree Residences are priced well above the average price of apartments in Kangaroo Point. The median price for a two-bedroom apartment currently sits at $479,000 with one-bedroom apartments (without river views) at Banyan Tree starting at $71,000 higher than this average. With the facilities and extra offering included at Banyan Tree, this development has an incredibly strong focus on owners, instead of investors so no rental appraisals are currently available. The body corporate fees at Banyan Tree Residences cover the 24-hour concierge and extensive resident facilities. Although they have not yet been finalised, it’s estimated they will range from $9,835 to $16,834 per year. This equates to between $189 and $315 a week. This is to be expected though when considering the level of facilities that are provided at Banyan Tree Residences Brisbane. Just across the river from the Brisbane CBD, it doesn’t get much better than Kangaroo Point in terms of location. 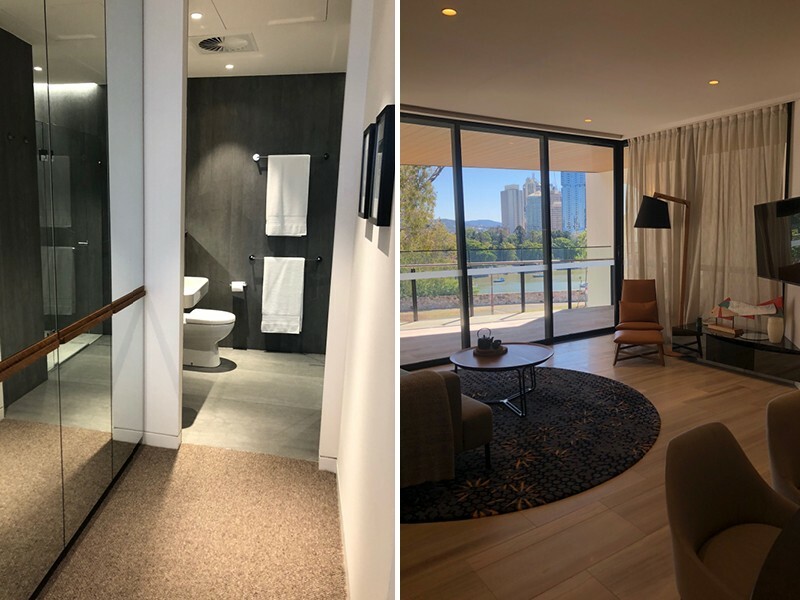 Also currently selling in Kangaroo Point is Lume on Shaftston Avenue which offers one, two, three and four-bedroom apartments as well as penthouses. Construction is already underway on Lume and the project is scheduled for completion in 2019. Lume also offers rooftop terrace facilities including an infinity pool with views that are comparable to Banyan Tree Residences. 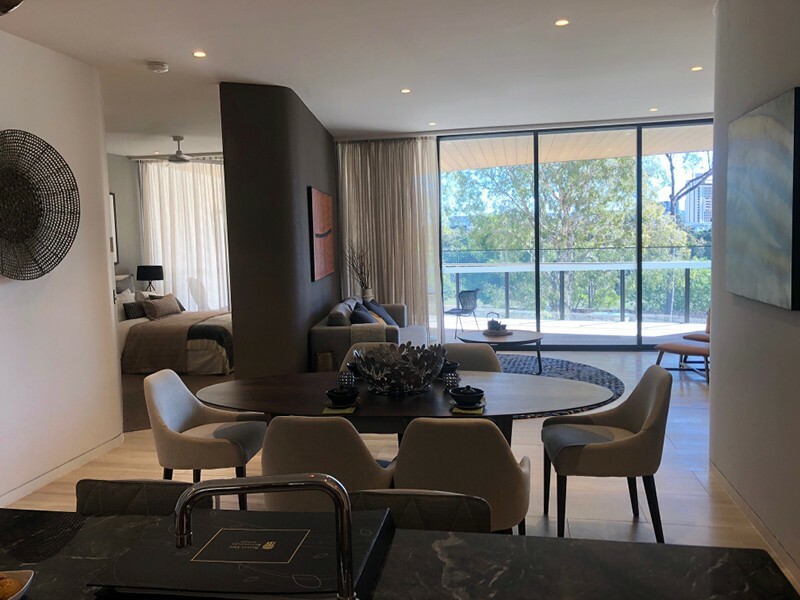 October 2019 will see the completion of The Holman which offers luxury three bedroom and four-bedroom apartments as well as two penthouses. Further afield, Banyan Tree Residences is likely to come into competition with other high-end developments across the city with a number of luxury projects that would appeal to similar buyers as Banyan Tree Residences. A few that come to mind are Gallery House in Hamilton, ONE Bulimba, Banc in Toowong and 443 Queen Street in the city. Banyan Tree is an international hotel and brand with a reputation for high-quality service and stunning facilities. The group currently operates 40 resorts and hotels, 60 spas, 70 retail galleries and 3 golf courses, spread across 29 different countries. Banyan Tree Hotels & Reports also has 10 residential projects internationally including residences in China, Indonesia, Mexico, Thailand and Vietnam. 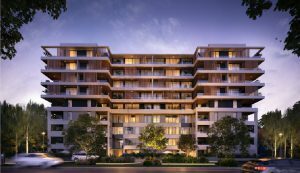 The Kangaroo Point development is Banyan Tree’s first Australian residential development, making it a very special project for the group. 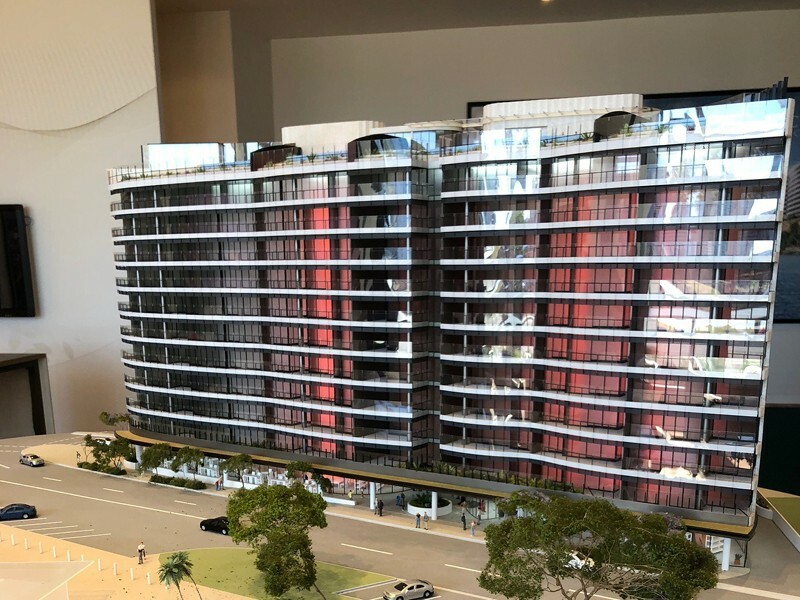 The Banyan Tree Residences Sales office is located at 48 River Terrace Kangaroo Point, right next door to the development site. The display suite is open from 9am – 6pm daily. The sales display is quite extensive: it spans two levels, with a reception and sales area downstairs and a fully constructed two bedroom apartment upstairs that totals 176sq m. There is parking available across the road from the display, although this may be limited on weekends. 0417 752 229 Click to display phone number.